The purpose of this article is to explain why DynaROM electrodes have expiration dates as well how to locate the expiration date. 2. 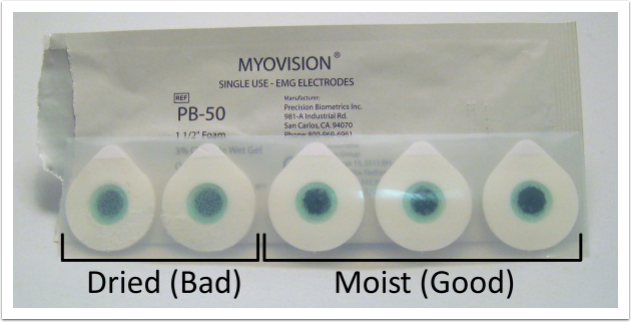 Visual test: each electrode has a small amount of a wet gel. The strip the electrodes are on is transparent so you can see this gel. It should look moist. Before taking the electrode off the strip, push on the gel area directly on the plastic strip - if the gel comes up to the strip, then they're good. But, if you push, and there's no "movement," then the gel has dried. See the photo below for a quick visual on dried vs moist. Fore more information on DynaROM electrode expiration dates, contact Technical Support using the information below.